Mmm, our chocolate chip Cookie Dough bar has remained a mouthwatering customer favorite for one simple reason. It tastes like real cookie Dough. What's the difference? Our stuff is made with just the right combination of a handful of natural, guilt-free ingredients, starting with a base of creamy cashew butter & organic date paste. If we could sell you our cookie dough in tubs, we guarantee you'd be eating it with a spoon. Until then, you'll just have to put in some work with your bare hands. 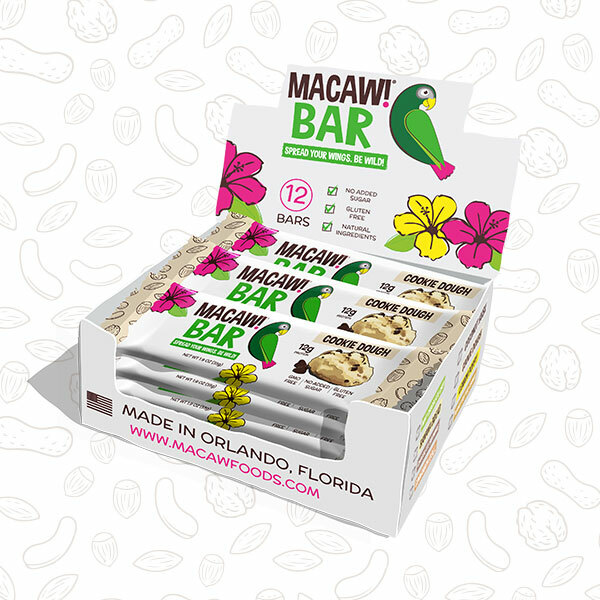 The founding recipe and origin of Macaw! Foods. Without Cookie Dough, we simply wouldn’t be here today. Originally formulated by our Godfather Adam Franklin, this recipe was passed along to me, in order to get things started. Neither of us could have predicted the long string of events that would proceed the exchange of that single recipe. I went to the store to gather the handful of ingredients, rushed home to my apartment, threw everything into the $40 kitchen mixer I bought off Craigslist, and as they say, the rest is history! In early 2017 there were a couple of growth related issues that posed a brief threat to the delicate profile of Cookie Dough. The first was related to an inadvertent switch in the supply chain origin of the cashews being used to make our cashew butter. You’d never know, but cashews from Brazil are much different from a Vietnamese, African, or Indian cashew. Long story short, we now use an organic cashew butter. And it’s delicious! The second issue was related to production. When switching from handmade, to an industrial extruder, texture changes can occur in the final product. Another long story short, it took about six months of trial and error to fully resuscitate the taste, texture, and integrity of Cookie Dough. 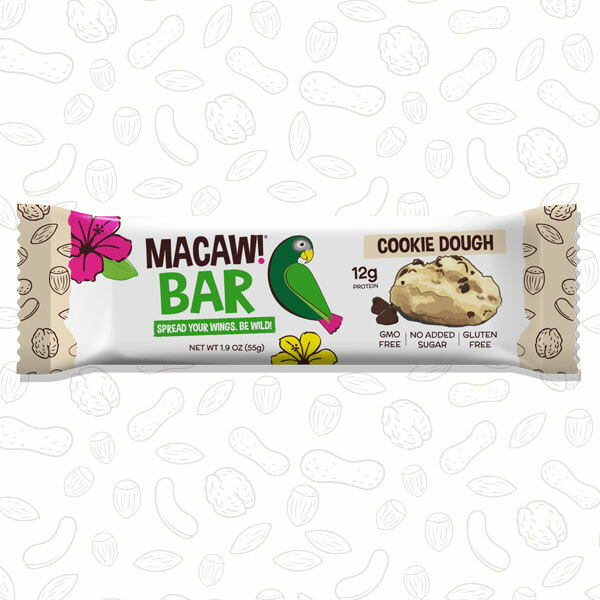 A lot of experimental flavors have come and gone over the years, but Cookie Dough remains the flagship Macaw! Bar, and probably always will. Just a handful of ingredients make up the base of this bar. When combined with organic dates, vanilla, and whey isolate,the creamy organic Indian cashew butter really gives the taste and texture of cookie dough! The combination of organic dark chocolate and oats are what really help make this bar taste like real chocolate chip cookie dough. 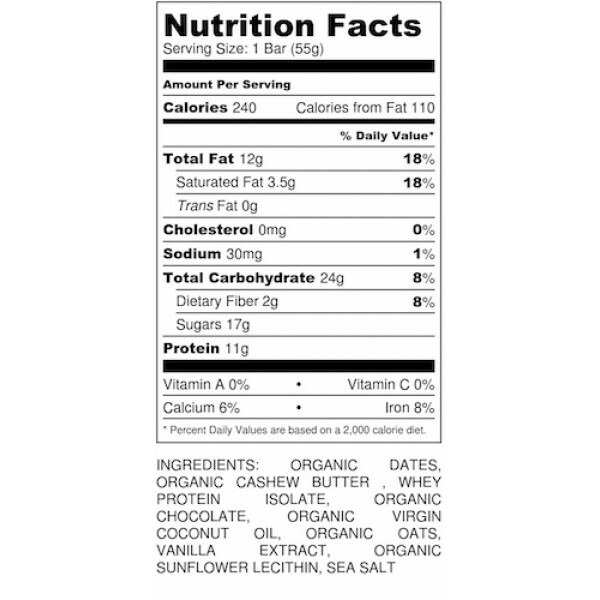 We use organic virgin coconut oil to improve the texture of the bars. We specifically use Virgin coconut oil only, as unlike more refined non-virgin oils, it retains it's flavor and health benefits.